Jeff Evans’ Family Night Magic Show is your entertainment solution that makes the whole family want to be in the same place at the same time. 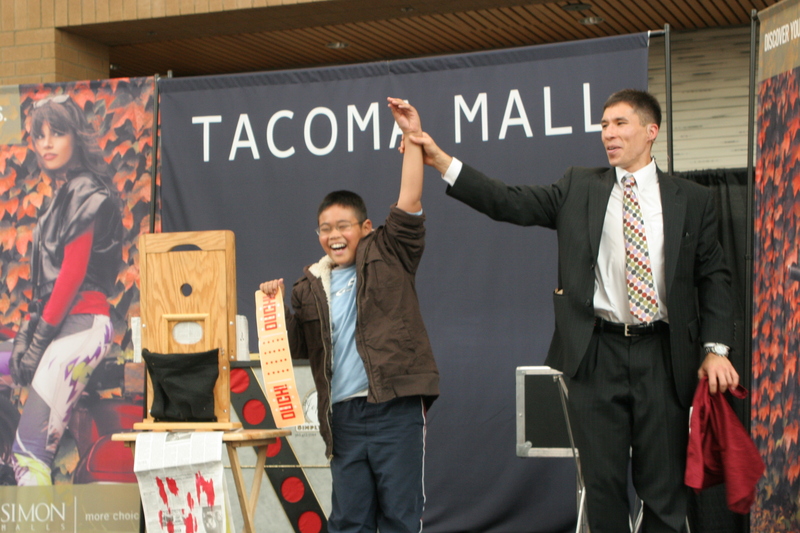 A favorite of schools, organizations, festivals, and events from Portland to Seattle and beyond since 1998, count on magician Jeff Evans to deliver a fun and amazing magic show that is ideal for kids and adults. Nothing cheesy here; even teens will go home impressed! “Thank you for an awesome performance today in Auburn! I’m so glad that we were able to have your magic show as part of our Kids Summerstage line-up. I was so pleased with the turn-out, and I could tell the audience loved your performance! It’s the perfect mix of funny and ‘wow, how’d he do that!?’. What I love most is how great the performance is for all ages – it really appeals to the young kiddos, but is equally entertaining for the adults. The audience interaction is great too!! Read more reviews about Washington state magician Jeff Evans at Google+. Jeff lives in Olympia, Washington and performs from Portland to Tacoma to Seattle and beyond. For more details, call him toll-free 877-412-5064 or send e-mail to jeff[at]amazementproductions.com. Be a fan and see what he’s been up to lately by being a fan on Facebook or following on Twitter. This entry was posted in Uncategorized and tagged carnival magician, family night, Portland magician, seattle magician, Tacoma magician. Bookmark the permalink.